Love & Friendship release date was Friday, May 13, 2016. This was a Limited in theaters release. Set in the opulent drawing rooms of eighteenth-century English society, Love & Friendship focuses on the machinations of a beautiful widow, Lady Susan Vernon (Kate Beckinsale), who, while waiting for social chatter about a personal indiscretion to pass, takes up temporary residence at her in-laws’ estate. While there, the intelligent, flirtatious, and amusingly egotistical Lady Vernon is determined to be a matchmaker for her daughter Frederica—and herself too, naturally. She enlists the assistance of her old friend Alicia (Chloë Sevigny), but two particularly handsome suitors (Xavier Samuel and Tom Bennett) complicate her orchestrations. Adapted from Jane Austen’s unpublished early novella Lady Susan. 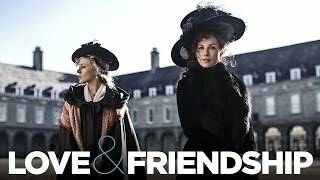 Not available on any other subscription services, Love & Friendship will be available for Prime members to stream and enjoy using the Amazon Video app for TVs, connected devices including Amazon Fire TV, and mobile devices, or online at Amazon.com/originals, at no additional cost to their membership.